Before this week, I did not want to see Hugo in theaters. The trailer makes Hugo look like an enjoyable adventure movie that is perfect for kids with an added bonus that it is directed by Martin Scorsese and in 3D. And so Hugo looked like a perfect movie for me to rent in a few months. Then Hugo was named the best picture of 2011 by the National Board of Review and I thought to myself, “Well, now I guess I have to see it.” And for the most part, Hugo was a pleasant surprise. 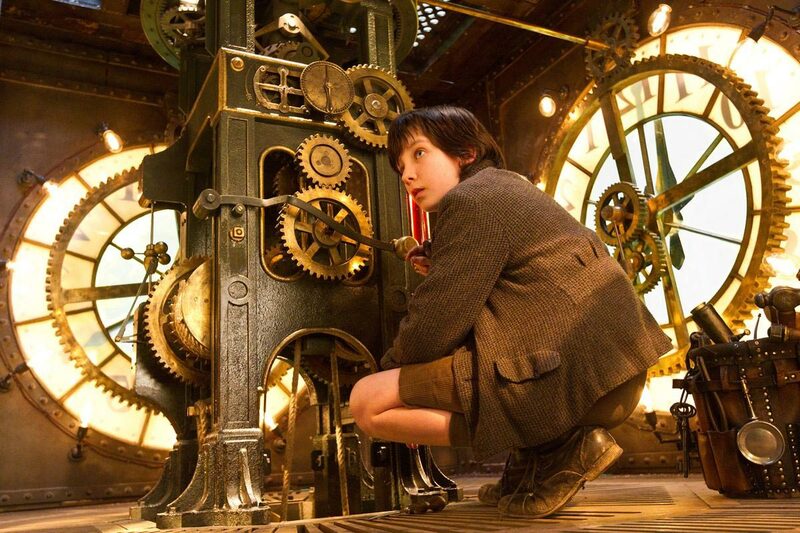 Hugo Cabret (Asa Butterfield) is an orphaned boy who is responsible for maintaining the clocks in a Paris railway station. (He is left the job after his alcoholic uncle abandons him.) Hugo lives behind the station’s walls, stealing food and hiding from the station inspector (Sacha Baron Cohen). His prized possession is an automaton that he and his father had been trying to repair. 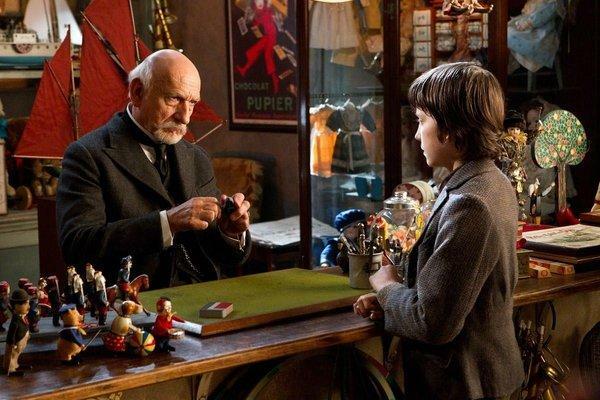 One day Hugo is caught stealing parts for the automaton by the toy shop owner (Ben Kingsley) and the old man confiscates Hugo’s book of instructions for the automaton and threatens to burn it. A devastated and desperate Hugo seeks out the old man’s goddaughter Isabelle (Chloe Moretz) for help to get his prized book back. The two children become fast friends, instantly bonding over their shared desire for an adventure. For Hugo, adventure comes from fixing his automaton and finding a message from his father. For Isabelle, adventure is in her books. This is when the pair unexpectedly discovers that Isabelle’s godfather is really Georges Méliès, one of cinema’s great pioneers. But Méliès’ film have long been forgotten by the public and he no longer finds joy from his work. The greatest challenge for the young protagonists becomes helping this great filmmaker reclaim his former glory. On one level, Hugo is a visual treat. 1930s Paris comes to life in a way only Martin Scorsese can envision. The train station is a lively and amusing setting, especially when the likes of Christopher Lee and Richard Griffiths shine in roles as secondary characters. Hugo’s world inside of the train station is a sort of magical fantasy of stairways, mazes, and clocks that the 3D technology only makes seem even grander. On another level, Hugo is also Scorsese’s love letter to cinema and the director’s ode to preserving cinema’s great works. When the film transitions from focusing just on Hugo to the life of George Melies, Hugo finds a stronger balance between its story and characters. You can feel Scorsese’s passion for cinema more than the actual 3D images that surround you. Wonderful montages reveal and recreate the world of early silent cinema. Films like the Lumiere Brothers Arrival of a Train at La Ciotat (1897) and Méliès’ A Trip to the Moon are more wonderful in Hugo than the first time I saw them in my college film classes. Film lovers will absolutely adore these scenes and embrace Hugo for this reason. There is probably no better director to pay tribute to these films than Scorsese. I should note that Hugo was my first time seeing a 3D movie since the technology became the “next big thing” in Hollywood. Hugo has been praised as the best use of 3D. It is integral to the film’s visual appeal and even acts as a commentary on the medium itself. (Let’s all marvel at how much film has changed since Melies’ day.) But if Hugo is the best 3D has been to date, then it is still not worth my time or money. While I can appreciate the use of 3D (because, well, I didn’t hate it), my moviegoing experience was not enhanced. I don’t need to feel like I am in a movie. I don’t need that fantasy tacked on in order to care about a movie. 3D technology is just something I will never care for, even when it’s done right.